It’s great to see the fatties back in their own version of Rocky. The Heavyweight Eating Championships of the World provide a backdrop for a really touching tale. There is a good opening to hook you into reading and the Judges aren’t the stars this time. Ezquerra does a great job with the fatties. Their rolls of flab and undulating gullets make you feel really queasy. Carl Heinz Pilchards-in-Tomato-Sauce Clayderman stages a concert involving weather that kills the audience. That name alone should tell you everything about this story. I’m not sure if there was originally a message about modern art or if it is just bizarre filler. This is an awesome story. 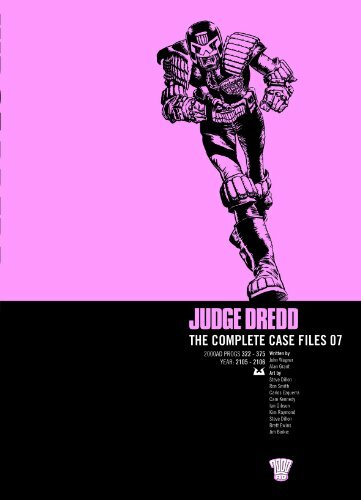 Once again we see Dredd on his own battling for his life and it’s not clear how or if he will make it. The werewolves are a credible threat and supply a good deal of relatable menace. We see Dredd ready to sacrifice himself for his city without a second thought. We also visit the Undercity that we haven’t seen since the Troggies. We learn that Judges take the long walk down there as well as the Cursed Earth. This popular location is anchored in old New York with Times Square, Broadway and Central Park. The posters for films Rocky 37 Mad Max 25 are unfortunately anachronistic. Dillon does a good job on the art with a nice touch to the action scenes. All his Judges look like Dredd however and if you don’t see their badges you can get confused as to who is who. His werewolves are great. Very bestial with inhuman eyes. Getting Dredd off his home turf and into the danger of space is a very dramatic choice. This is part thriller and part disaster movie and definitely holds your attention. Unfortunately the reveal at the end without any form of detective work feels far too flimsy. Even with such a short page-count the choice to use full page panels to convey the epic scope of the disaster is a brilliant one. This is a brilliant tale and not least in its innovative telling. It begins with a juve and his internal monologue. But you quickly realise he is actually recording a video. This predates the YouTube generation by decades but predicts it wonderfully. The device of the Stupid Gun, the descent of poor Eck into crime and the way criminals have a knack of perverting anything new to their ends are all fantastic ideas superbly delivered. The Runaway train adds a climactic final act too. Ron Smith’s art is superb as his exaggerated faces are perfect for the moronic victims of the Stupid Gun. His rendering of the Mega-city combines futurist, gothic and art deco to create a wonderfully characterful landscape. A citizen runs from the law and gets into even bigger trouble. This was told much better in a previous prog. The gag line at the end is worse than Schwarzenegger. Lovely Ron Smith art. A Lovecraftian tale, heavily influenced by Alien and set in the Wild West of the Cursed Earth. How could this not be a great story? With several issues to slowly build suspense and malevolence you really get drawn into the peril of the situation. As the threat comes from an unknown alien literally anything can happen making the outcome uncertain. A high judge bodycount ups the stakes too. 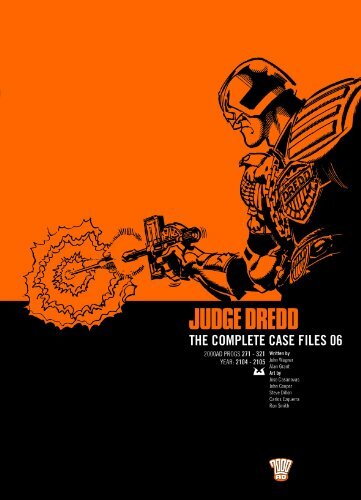 The terrifying part is when Dredd is possessed by the creature forcing him to kill innocent judges. Committing any crime is an anathema to Dredd and being totally out of control is a really frightening prospect. This is his worst nightmare. Ezquerra is in his element with the Cursed Earth, muties and alien life forms. This is very much his forte.